As we embark on the first few weeks of autumn, the eagerness to dive headfirst into fall apparel is at an all time high. Unfortunately, for most of us, brisk weather is still quite a ways away. In the meantime, a lightweight, warm-to-cold weather scarf is an easy and stylish way to provide the winter-comfort we’re all craving. There are dozens of ways to wear a scarf, and choosing the right style will make all the difference in making your outfit on trend. For the better part of October, drape your scarves freely around your neck so that both ends fall loosely in the front. Adjust accordingly to leave a generous gap between your neck and the fabric. The longer the scarf, the better. Knotting your scarf at the bottom will also provide a more relaxed visual. As the temperature drops, the scarves should rise, until the weather calls for a snug wrap around the neck. Until then, keep it loose. 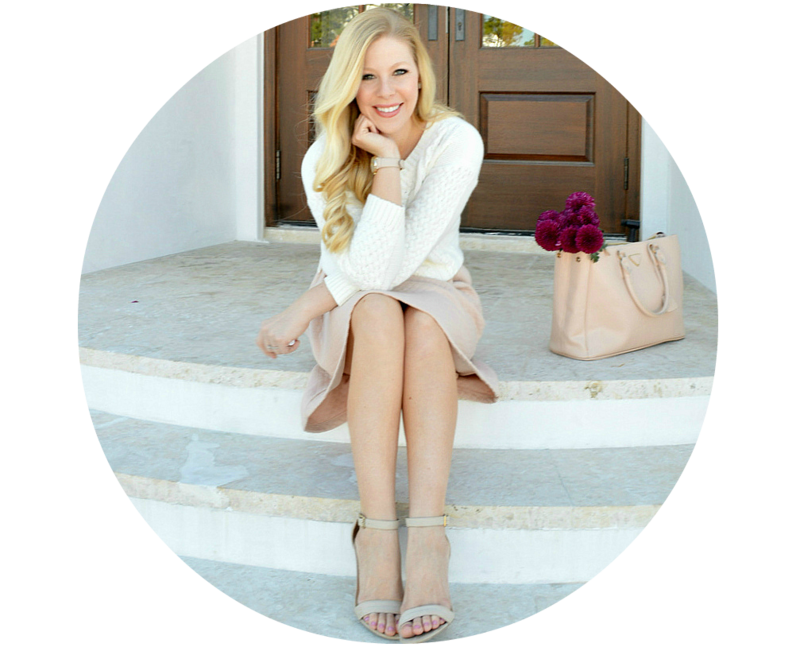 To see more outfit inspiration on how to style your autumn scarves swing by LaurenConrad.com to check out my latest column. Love love the scarf and the shoes! I love how you ease into fall with this comfortable look. The scarf definitely stands out. Fabulous scarf and rings! You look so pretty! I love the sound of autumn! You look gorgeous. 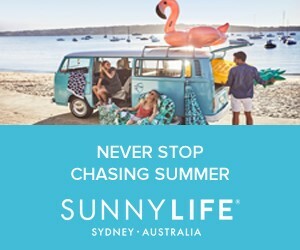 Its still HOT in my city so I don't feel any transition happening. Loving your shoes and that gorgeous scarf! Denim dresses are so versatile, and yours is perfect. Those shoes are also fabulous! Wow you look so classy. Love the dress and heels!! I love the scarf. Great post. Love this outfit! Just perfect! Those shoes are amazing! Hope you have a wonderful day! Ohhhh the pops of pastels AND fall colors are a great combo! Love the scarf. You look fab! Cute outfit! Really love the accessories! Great early fall styling, babe! You look lovely! You look gorgeous in your outfit! And i love your earrings! You always look so perfect! Love this little denim dress combo :). Love the color palette of this look, and those shoes are fabulous! Your dress is really cute. I've never head of Riff Raff before but now I'm going to have to check them out. You look flawless! 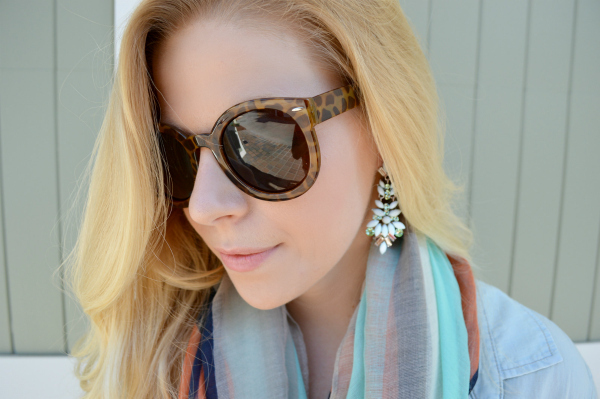 I love how you styled this scarf and found matching sandals! Loving absolutely everything about this look! The scarf and booties are my fave! You look beautiful as always. Love that scarf! They have great stuff. I love Riffraff. I love this outfit and I wore a similar one on my blog yesterday, a chambray dress and a scarf. 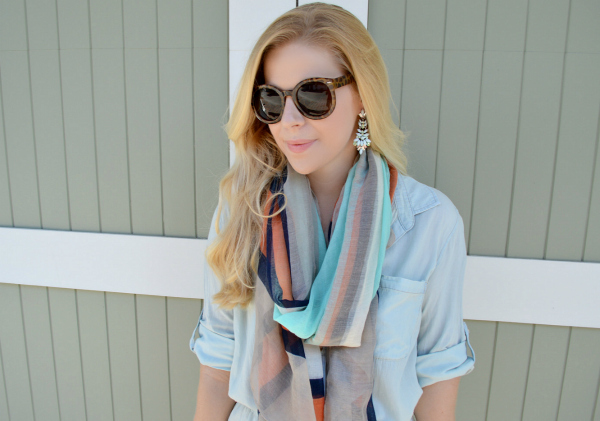 I love the color of the denim and I love the designs on the scarf! Another amazing outfit! Love the scarf tip too. This look is amazing! I love the scarf and orange shoes. I absolutely love long sleeve dresses with scarfs for transitioning into Fall. You accessorized this look perfectly. Beautiful! Pretty look! Love the baby blue color on you! Omg LOVE the colors in your outfit! The orange mixed with light blue is adorable! Stunning! Love this dress + scarf! love this look. i been getting into scarfs lately, this is so inspiring and im obsessed with those shoes! Those blue earrings are so pretty. I've been looking for some earrings for my sisters homecoming dress and I think she would love those. Thanks for sharing girlie. I cannot find those shoes on shoedazzle?!?!! are they old? Love how you combined all of these soft/pastel colors for a casual yet chic look! The light chambray with a pop of orange is a perfect combo! How gorgeous your scarf is, great description of how to use it also! this outfit is darling! especially loving your shoes -- they're gorgeous. Perfect transitional look! ;) Loving these shoes too. So fun! Amazing style. Love these shoes and the scarf. This dress works perfectly for the colder weather.